I’m 15 and have watched almost every horror movie I can think of since I was little but there was just one thing I couldn’t bare to watch without crawling out of my mothers arms and screaming! 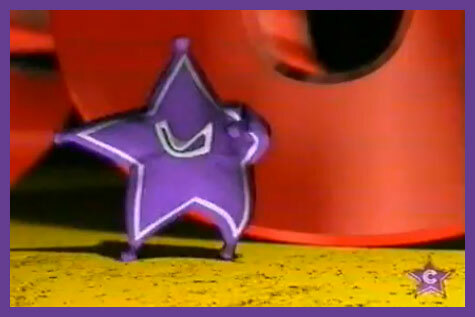 It was the purple dancing star, the logo of the Comedy Channel on Foxtel (formally known as Austar). I don’t know what it is about it but it just makes me cringe! The ad always came on before my parents favourite show “Whose Line Is It Anyway?” so they would have to wait 2 minutes for the show to start and then watch it. I wish I knew what it was that scared me so much! UNK SEZ: Thanks for this truly stellar traumafession Leticia! Don’t feel strange about getting the willies from a mere logo, we’e gotten traumafessions concerning those before! You’ve also reminded me of the brilliant short THE S FROM HELL! Have fun relating to that film below! You are 100% right to be shocked and horrified by that thing, both because of its creepy dancing and because IT HAS NO EYES. With its shapeshifting, disconcerting speed and ability to move in the dark (with no eyes), if it ever made it out of the television, it would clearly try to eat us in the night. I’m thankful you alerted me. Unk: Thanks for sharing the screen gems film. I’d always thought the logo was like some creepy eye developed by the freemasons to stare though my soul, and the music just sounds like their synthesizer bugle to usher in 10,000 years of darkness.